The annual Australian Supply Chain & Logistics Awards were presented by the Supply Chain Logistics Association of Australia at the Dockside Pavilion, Darling Harbour, Sydney on 4th November 2015. 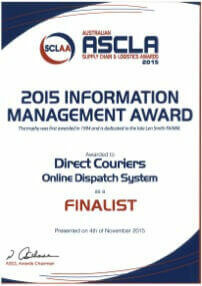 Direct Couriers Submitted two entries the Information Management Award Category. This award recognises the significant achievement in the application of information technology within its supply chain. Our first award submission focused on the customer benefits of our industry leading online dispatch system. The Direct Couriers Online Dispatch System was developed in-house, specifically for those customers that either run their own small fleet of vehicles but require additional ad-hoc/regular run support, or those companies that wish to remove their own fleet and outsource the delivery altogether but need to control the dispatch process. Customers with existing fleets are provided with the Direct Couriers PDA hardware for each driver and are given access to the Online Dispatch system using a secure login ID and password. The system allows customers to book all deliveries from one central dispatch point for allocation to their company drivers, dedicated Direct Courier drivers (Hourly Hire) or the general Direct Courier fleet ( Ad-hoc). This is designed to centralise all bookings into one screen so the existing fleet and dedicated drivers can be utilised to their maximum capacity. Our Customers can then select which deliveries to allocate to company or dedicated drivers and which to be moved over to the general Direct Couriers fleet. We were announced as one of 9 finalists for the Information Management Award. Although we weren't winners on the night, we are proud to be acknowledged as award finalists in a year that attracted an extremely high and diverse number of entries in every category.